Week 25...just about 15 weeks to go! Time flies. I was finally able to buy a few new clothing items that will hopefully work with me for the remainder of my pregnancy. Some of it is maternity, some of it is just a little loose-fitting or stretchy or one size up. I don't want to fill my closet with maternity clothes with only a few months to go. Liam is now the size of a rutabaga...whatever that is. And my baby book tells me that my uterus is the size of a soccer ball! Alex was in disbelief when I told him. I feel Liam rolling around in there a lot. That's the only way I know to describe it. It's less of a kick (though there's still plenty of that) and more of a rolling motion, like he's changing positions or swimming or something. It's really weird...but good to know that he's still there and seemingly happy. 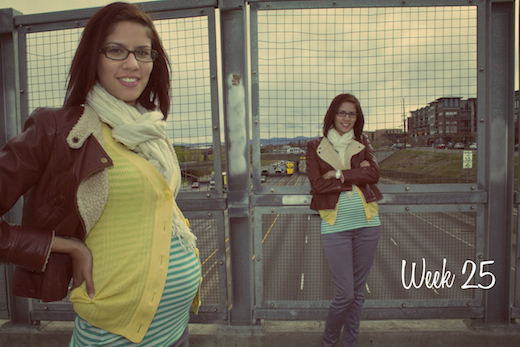 This week we took a picture on the pedestrian bridge over I-25. The bridge connects the Highlands neighborhood (by far my favorite neighborhood in Denver) with Downtown Denver. There's also this big red sculpture right beside it...I'm not sure what it is. As I told you in last week's post Denver is just full of funky art installations. Oh yeah, and spring has all but disappeared in Denver! I've had to layer up lately because of the frigid temps. I'm hoping as we welcome in May that we will also welcome in some much warmer weather.